The plot of Robbers' Roost is spare, but it's effective. A crippled cattle rancher (the rancher is crippled, not the cattle) has hired two rival gangs to work his ranch, believing that the gang members will be more focused on competing with each other than stealing his cattle. After George Montgomery discovers one of these gangs in the saloon, he decides to also take up a job at the ranch because it puts him in close proximity to the people he's been looking for. One of the gangs is led by Richard Boone, future star of the hit western TV series Have Gun - Will Travel, though here he's harder to spot without his trademark mustache. The other gang is led by Peter Graves, younger brother of Gunsmoke star James Arness and future lead from Mission: Impossible and Airplane. An actress by the name of Sylvia Findley plays the young sister of the crippled rancher. She's fine, but I have no idea who she is and she doesn't make much of an impression. A peek at her IMDB page reveals that she only appeared in one other movie. The story is based on a Zane Grey novel, and is probably better for it. Zane Grey was one of the most prolific western authors of his time, cranking out nearly a hundred books during the first half of the 20th century. As such, this western movie doesn't focus on dusty trails and rocky spires, on frontier expansion or hostile natives, but instead focuses on the human heart. George Montgomery is looking for revenge. We don't know why until the end, but this story is less concerned with the outside world itself. No, this movie is about what lies within. This movie is about vengeance. Adding to the unique flavor of this western is the cinematography and location filming, which took place in Durango, Mexico as opposed to the familiar landscapes of Arizona, New Mexico, and Utah. Filmed in color, the palate is a mix of drab, earthy colors like tan, green, and brown. Our characters stand out against this with their colorful wardrobes (color was a big part of the factual old west) and colorful personalities. By choosing to film in a non-traditional location, this movie looks different from others of the time. Don't get me wrong: it's beautiful, but this is not the mythic west of John Wayne. 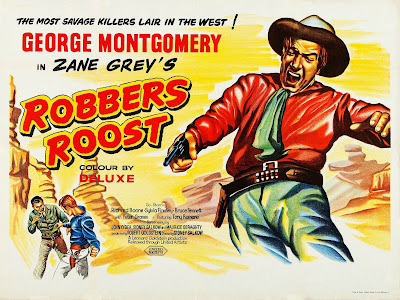 Robbers' Roost was directed by Sidney Salkow, a name that might not be instantly recognizable. Salkow is just one of the many, many filmmakers who made lots of movies over a long, productive career, but who never made a standout hit. His films are good, shot and directed with a workmanlike competence, but never quite rising to the top. He made a ton of adventure films and westerns during the thirties and forties, learning the skills that made him a great choice for a movie like this one. He's probably best known for two flicks he made with Vincent Price in the sixties. First, in 1963, he directed Twice Told Tales, an anthology horror film based on the work of Nathaniel Hawthorne. More notably, his 1964 film The Last Man on Earth was the first film adaptation of Richard Matheson's horror classic novel I Am Legend. Sidney Salkow might not be one of the more famous directors in movie history, but he always delivered solid product. That's really the best endorsement I can offer for Robbers' Roost. It's not a classic or a powerhouse, but it's a solid product made during a time when every film was sure to have a compelling story and featured interesting characters that you wanted to watch. Movies like this one are the reason that I continue to lose my grip on our current movies, which have largely sacrificed character and human drama in favor of spectacle and visual effects. There's spectacle to be had in Robbers' Roost, and blood too, but that comes organically from the actions of our characters and never takes us out of the story. This competent, visually interesting, morally ambiguous western shines a light on the human heart and the desire for revenge that burns like a hot coal within. That revenge will be served far from civilization, deep within the isolation of Robbers' Roost.